In early June, meteorologists at the National Weather Service in Albuquerque, New Mexico, were puzzled: There was a big splotch on the radar that didn’t look like any weather system they’d ever seen. Maybe their software had a bug? Turns out, the dark green blob hovering over Albuquerque wasn’t a software glitch at all but a giant swarm of grasshoppers. John Garlisch, an agricultural extension agent at New Mexico State University, told Modern Farmer that the state’s dry winter allowed more grasshopper eggs than usual to hatch this spring, and the ongoing drought has caused a dearth of fresh growth on rural rangeland, forcing the swarm to take flight in search of greener pastures. The well-watered gardens of Albuquerque must’ve looked mighty appealing. By now, the grasshoppers have mostly died of natural causes or been eaten by cats, says forecaster Brent Wachter of the National Weather Service. But this summer’s incident raises the question: As climate change continues to impact weather patterns across the West, will grasshopper swarms big enough to show up on Doppler radar become a more regular concern? And if so, how concerned should we be? To find out, I called population ecologist Gary Belovsky, who’s been studying grasshoppers in western Montana for 37 years. He's currently researching how climate change affects grasshopper outbreaks. If you’re looking for a simple, straightforward answer, though – something along the lines of “climate change causes drought and drought causes more grasshoppers” – look elsewhere. While drought can indeed increase grasshopper populations for the short term, the picture Belovsky paints over the long run is far more complex. In the National Bison Range where he conducts his research, summers have grown consistently drier and hotter over the last century. Yet the month of June has gotten cooler and wetter – and since that’s when most plant growth happens, overall plant production has increased. That gives grasshoppers more food to eat, which in turn increases their numbers. But under the withering heat of summer, plants also turn brown more quickly, so without fresh leaves to nosh on, grasshoppers can thrive for a period but ultimately don’t live as long. “We’re trying to figure out the ecological impact of that,” Belovsky says. “If they don’t live as long, do they lay as many eggs? If they don’t lay as many eggs, can they keep up their populations?" Did he just say keep up grasshopper populations? Surely we don’t want more grasshoppers? A grasshopper in the author's backyard in Paonia, Colorado. Photograph by the author. Well, it depends. Our understanding of the pests has come a long way since 1874, when an outbreak of Rocky Mountain locusts ate their way through the West, devouring crops, clothing, horse harnesses – “everything but the mortgage,” farmers griped. Grasshoppers’ dead bodies were so thick their guts clogged railroad tracks and stopped the trains. Just 30 years later, the Rocky Mountain locust apparently went extinct. No one knows exactly why or what the biological consequences were, but generally, the loss was counted as a win. Since then, smaller outbreaks of other grasshopper species have continued to periodically devastate Western rangelands, and we've deployed ample pesticides to keep them in check. Now, Belovsky’s research indicates that grasshoppers may actually be essential in certain ecosystems. “No doubt there are times when grasshoppers become a serious economic threat to ranchers, but we’ve also found there’s particular grasslands where the grasshoppers are absolutely crucial to maintaining the nitrogen cycle,” he explains. Grasshopper outbreaks may help some Western ecosystems the same way wildfire does: by knocking them back to an earlier developmental stage and allowing new growth. In the short term, a huge swarm of grasshoppers mowing down fields is detrimental to cattle, sheep and wildlife. 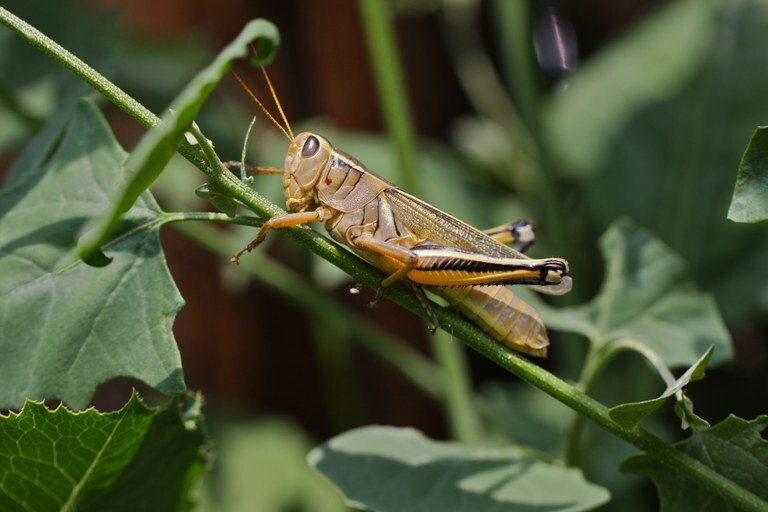 “But if you take a longer perspective, heavy consumption by grasshoppers may change the plant community and bring in new species that are more nutritious to wildlife and livestock,” Belovsky says. That leaves rangeland managers with a conundrum: to spray, or not to spray?